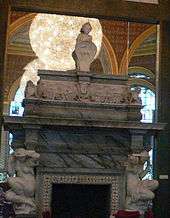 The V&A has its origins in the Great Exhibition of 1851, with which Henry Cole, the museum's first director, was involved in planning; initially it was known as the Museum of Manufactures, first opening in May 1852 at Marlborough House, but by September had been transferred to Somerset House. 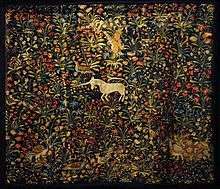 At this stage the collections covered both applied art and science. Several of the exhibits from the Exhibition were purchased to form the nucleus of the collection. By February 1854 discussions were underway to transfer the museum to the current site and it was renamed South Kensington Museum. In 1855 the German architect Gottfried Semper, at the request of Cole, produced a design for the museum, but it was rejected by the Board of Trade as too expensive. The site was occupied by Brompton Park House; this was extended including the first refreshment rooms opened in 1857, the museum being the first in the world to provide such a facility. The official opening by Queen Victoria was on 22 June 1857. In the following year, late night openings were introduced, made possible by the use of gas lighting. 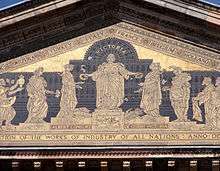 This was to enable in the words of Cole "to ascertain practically what hours are most convenient to the working classes"—this was linked to the use of the collections of both applied art and science as educational resources to help boost productive industry. 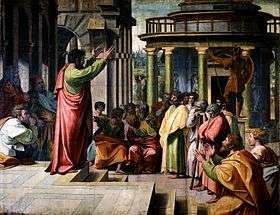 In these early years the practical use of the collection was very much emphasised as opposed to that of "High Art" at the National Gallery and scholarship at the British Museum. 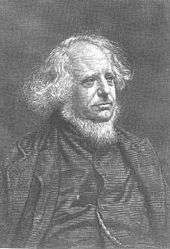 George Wallis (1811–1891), the first Keeper of Fine Art Collection, passionately promoted the idea of wide art education through the museum collections. This led to the transfer to the museum of the School of Design that had been founded in 1837 at Somerset House; after the transfer it was referred to as the Art School or Art Training School, later to become the Royal College of Art which finally achieved full independence in 1949. 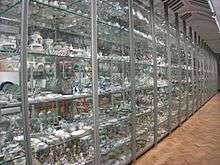 From the 1860s to the 1880s the scientific collections had been moved from the main museum site to various improvised galleries to the west of Exhibition Road. In 1893 the "Science Museum" had effectively come into existence when a separate director was appointed. The opening ceremony for the Aston Webb building by King Edward VII and Queen Alexandra took place on 26 June 1909. In 1914 the construction commenced of the Science Museum, signalling the final split of the science and art collections. 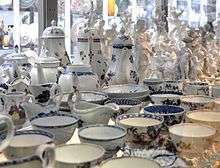 Since then the museum has maintained its role of one of the world's greatest decorative arts collections. Victoria and Albert Museum's came second to the London's top paid exhibitions in 2015 with the record-breaking Alexander McQueen show (3,472 a day). The interiors of the three refreshment rooms were assigned to different designers. 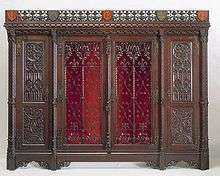 The Green Dining Room 1866–68 was the work of Philip Webb and William Morris, and displays Elizabethan influences. The lower part of the walls are panelled in wood with a band of paintings depicting fruit and the occasional figure, with moulded plaster foliage on the main part of the wall and a plaster frieze around the decorated ceiling and stained-glass windows by Edward Burne-Jones. The Centre Refreshment Room 1865–77 was designed in a Renaissance style by James Gamble, the walls and even the Ionic columns are covered in decorative and moulded ceramic tile, the ceiling consists of elaborate designs on enamelled metal sheets and matching stained-glass windows, the marble fireplace was designed and sculpted by Alfred Stevens and was removed from Dorchester House prior to that building's demolition in 1929. The Grill Room 1876–81 was designed by Sir Edward Poynter, the lower part of the walls consist of blue and white tiles with various figures and foliage enclosed by wood panelling, above there are large tiled scenes with figures depicting the four seasons and the twelve months these were painted by ladies from the Art School then based in the museum, the windows are also stained glass, there is an elaborate cast-iron grill still in place. The main façade, built from red brick and Portland stone, stretches 720 feet (220 m) along Cromwell Gardens and was designed by Aston Webb after winning a competition in 1891 to extend the museum. Construction took place between 1899 and 1909. 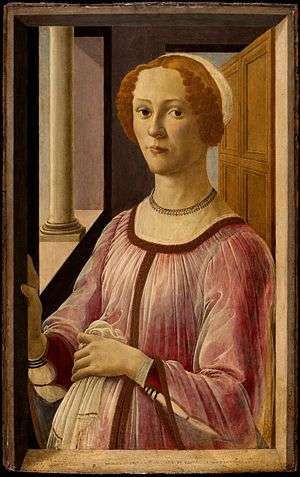 Stylistically it is a strange hybrid, although much of the detail belongs to the Renaissance there are medieval influences at work. 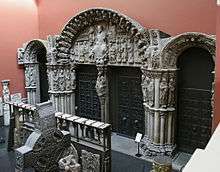 The main entrance consisting of a series of shallow arches supported by slender columns and niches with twin doors separated by pier is Romanesque in form but Classical in detail. Likewise the tower above the main entrance has an open work crown surmounted by a statue of fame, a feature of late Gothic architecture and a feature common in Scotland, but the detail is Classical. The main windows to the galleries are also mullioned and transomed, again a Gothic feature, the top row of windows are interspersed with statues of many of the British artists whose work is displayed in the museum. Prints and drawings from the over 750,000 items in the collection can be seen on request at the print room, the "Prints and Drawings study Room"; booking an appointment is necessary. 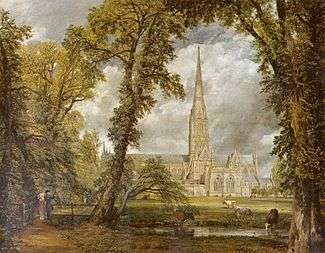 The collection of drawings includes over 10,000 British and 2,000 old master works, including works by: Dürer, Giovanni Benedetto Castiglione, Bernardo Buontalenti, Rembrandt, Antonio Verrio, Paul Sandby, John Russell, Angelica Kauffman, John Flaxman, Hugh Douglas Hamilton, Thomas Rowlandson, William Kilburn, Thomas Girtin, Jean Auguste Dominique Ingres, David Wilkie, John Martin, Samuel Palmer, Sir Edwin Henry Landseer, Lord Frederic Leighton, Sir Samuel Luke Fildes and Aubrey Beardsley. Modern British artists represented in the collection include: Paul Nash, Percy Wyndham Lewis, Eric Gill, Stanley Spencer, John Piper, Graham Sutherland, Lucian Freud and David Hockney. 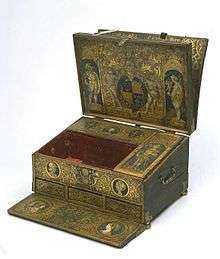 The Soulages collection of Italian and French Renaissance objects was acquired between 1859 and 1865, and includes several cassone. 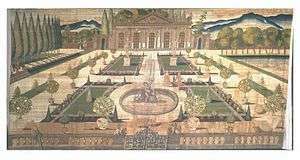 The John Jones Collection of French 18th-century art and furnishings was left to the museum in 1882, then valued at £250,000. One of the most important pieces in this collection is a marquetry commode by the ébéniste Jean Henri Riesener dated c1780. 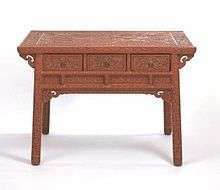 Other signed pieces of furniture in the collection include a bureau by Jean-François Oeben, a pair of pedestals with inlaid brass work by André Charles Boulle, a commode by Bernard Vanrisamburgh and a work-table by Martin Carlin. 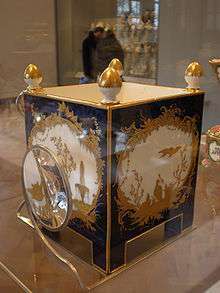 Other 18th-century ébénistes represented in the Museum collection include Adam Weisweiler, David Roentgen, Gilles Joubert & Pierre Langlois. 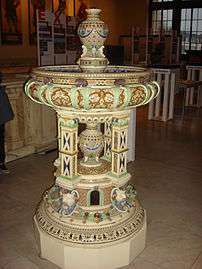 In 1901, Sir George Donaldson donated several pieces of art Nouveau furniture to the museum, which he had acquired the previous year at the Paris Exposition Universelle. 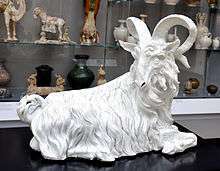 This was criticised at the time, with the result that the museum ceased to collect contemporary items and did not do so again until the 1960s. 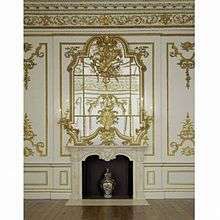 In 1986 the Lady Abingdon collection of French Empire furniture was bequeathed by Mrs T. R. P. Hole. 1 2 "Visits made in 2015 to visitor attractions in membership with ALVA". ALVA. Retrieved 9 March 2016. 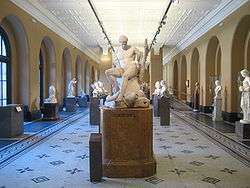 ↑ "ARTS | V&A to have £150m facelift". BBC News. 18 April 2002. Retrieved 12 May 2011. ↑ "'Our Europe is an inclusive Europe': the Victoria and Albert Museum's new European Galleries". Apollo. ↑ "FuturePlan Live: Europe 1600 – 1815". Victoria & Albert Museum. 1 2 3 Sheppard 1975, p. 248. ↑ "A Grand Design: The Art of the Victoria and Albert Museum". ArtMag.com. ↑ "A Grand Design: A History of the Victoria and Albert Museum". Victoria and Albert Museum. This microsite has been adapted from the book A Grand Design: The Art of the Victoria and Albert Museum, which was published to support the exhibition of the same name. To reflect the structure of the book the site is divided into essays, listed in the navigation to the left of the screen. Each essay contains the relevant illustrations and is followed by the images of objects and their catalogue entries from the book. Footnotes follow at the end of each essay. Authors of essays and catalogue entries are credited with each piece. 1 2 Physick 1982, p. 270. ↑ "Designing Britain – BCMI Introduction". Vads.ahds.ac.uk. 20 December 2002. Retrieved 12 May 2011. 1 2 Banham & Hillier 1976, p. 58. ↑ Klettner, Andrea (29 January 2010). 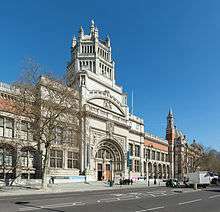 "New contest revives V&A extension hopes". Architectsjournal.co.uk. Retrieved 12 May 2011. 1 2 Martin Bailey (15 August 2013), V&A Dundee gets planning green light The Art Newspaper. ↑ Mitchell, Jamie (1 September 2009). 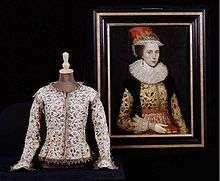 "Victoria and Albert Museum comes to Dundee". FX Magazine. Retrieved 12 May 2011. ↑ Martin Wainwright (22 December 2008). "Blackpool hopes V&A might like to be beside the seaside". The Guardian. London. Retrieved 12 May 2011. 1 2 "Blackpool Museum would have cost £60m". Blackpool Gazette. 3 December 2008. Retrieved 12 May 2011. ↑ "2015's most popular exhibitions by genre and city". 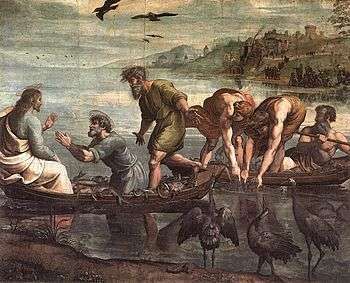 theartnewspaper.com. Retrieved 2016-04-05. ↑ "Victoria and Albert Museum: Quadrangle". Royal Institute of British Architects. Retrieved 16 December 2010. ↑ "Sackler Centre for arts education at the V&A". Victoria and Albert Museum. Retrieved 16 December 2010. 1 2 Physick 1982, p. 174. ↑ "Victoria and Albert Museum: Competition to complete the museum". Royal Institute of British Architects. Retrieved 16 December 2010. 1 2 Physick 1982, p. 277. ↑ "Completed Projects – Victoria and Albert Museum". vam.ac.uk. 5 May 2011. Archived from the original on 9 October 2011. Retrieved 12 May 2011. ↑ "About the V&A and RIBA Architecture Partnership Collections – Victoria and Albert Museum". vam.ac.uk. 6 May 2011. Retrieved 12 May 2011. ↑ "109. Window from Sir Paul Pindar's House, Bishopsgate. [image 400x556 pixels]". Fromoldbooks.org. Retrieved 12 May 2011. 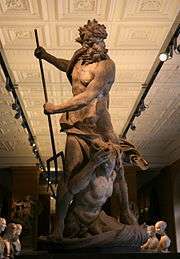 ↑ "Image – V&A". vam.ac.uk. Retrieved 12 May 2011. 1 2 "About the Collection – Victoria and Albert Museum". vam.ac.uk. 8 March 2004. Archived from the original on 21 March 2009. Retrieved 21 August 2011. 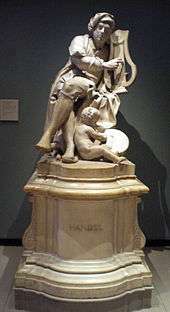 ↑ "Image – V&A". vam.ac.uk. 14 August 2011. Retrieved 21 August 2011. 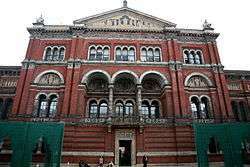 1 2 "150 Facts about the V&A for the 150th Anniversary – Victoria and Albert Museum". vam.ac.uk. 14 August 2011. Archived from the original on 29 July 2011. Retrieved 21 August 2011. 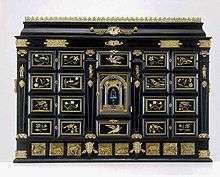 ↑ "The Mazarin Chest Project – Victoria and Albert Museum". vam.ac.uk. Retrieved 21 August 2011. ↑ "Book Collections – Victoria and Albert Museum". vam.ac.uk. 21 October 2010. Archived from the original on 6 May 2010. Retrieved 21 August 2011. ↑ "Stock photo and image search by V&A Images". VandAimages.com. Retrieved 21 August 2011. 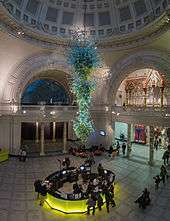 ↑ "Forster Collection – Victoria and Albert Museum". vam.ac.uk. 14 August 2011. Retrieved 21 August 2011. 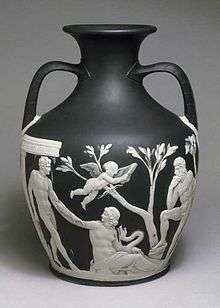 ↑ "Dyce Collection – Victoria and Albert Museum". vam.ac.uk. 14 August 2011. Retrieved 21 August 2011. ↑ "Beatrix Potter Collections – Victoria and Albert Museum". vam.ac.uk. Retrieved 21 August 2011. 1 2 Dodds, D.; Ravilious, E. (2009). "The Factory Project: digitisation at the Victoria and Albert Museum". Art Libraries Journal. 34 (2): 10–16. ↑ Victoria and Albert Museum; Online Museum; Web Team. "Comics in the National Art Library". www.vam.ac.uk. Retrieved 19 October 2015. ↑ "Bashaw – Victoria and Albert Museum". vam.ac.uk. 21 April 2011. Retrieved 21 August 2011. ↑ "Stained Glass – Victoria and Albert Museum". vam.ac.uk. Retrieved 21 August 2011. 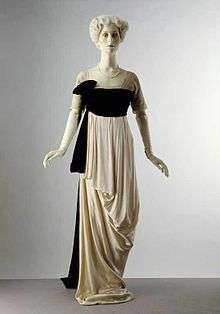 ↑ "1960s Fashion Designers – Victoria and Albert Museum". vam.ac.uk. 21 October 2010. Retrieved 21 August 2011. ↑ Frances Hartog (Autumn 2008). "Costume cleaning conundrums". vam.ac.uk. Retrieved 16 March 2012. 1 2 3 Wainwright, Oliver (27 November 2012). "Pull up a chair: inside the V&A's brilliant new furniture gallery". The Guardian. Retrieved 14 December 2012. ↑ Stockley, Philippa (29 November 2012). "The V&A's new furniture gallery". Homes and Property: The Evening Standard. Retrieved 14 December 2012. ↑ "London Museums". London School of Economics. Retrieved 14 December 2012. ↑ "Leg from a stool or chair". 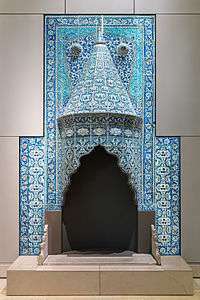 V&A Collections Online. Retrieved 14 December 2012. ↑ "Image – V&A". vam.ac.uk. Retrieved 21 August 2011. ↑ "Tiaras – V&A Exhibition". vam.ac.uk. Retrieved 21 August 2011. ↑ Nina Siegal (10 May 2008). 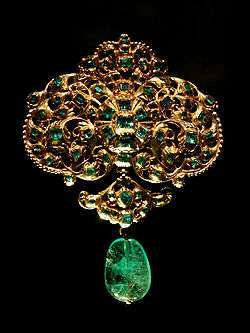 "Jewel in Its Crown". ARTINFO. Retrieved 14 May 2008. 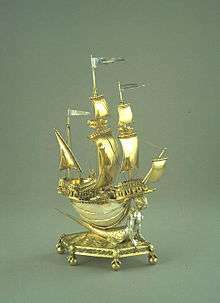 ↑ "British Silver Pre-1800, Room 65 – Victoria and Albert Museum". vam.ac.uk. 14 August 2011. Retrieved 21 August 2011. 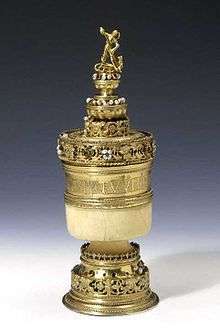 ↑ "The Sacred Silver Collection – Victoria and Albert Museum". vam.ac.uk. 14 August 2011. Retrieved 21 August 2011. ↑ "Paul de Lamerie Silver – Victoria and Albert Museum". vam.ac.uk. 14 August 2011. Retrieved 21 August 2011. 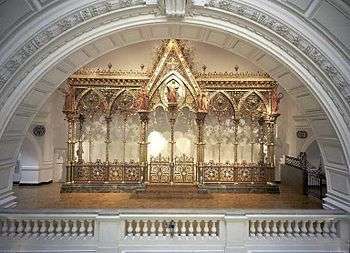 ↑ "The Hereford Screen – Victoria and Albert Museum". vam.ac.uk. Retrieved 21 August 2011. ↑ "Gloucester candlestick". Britannica Online Encyclopedia. Retrieved 21 August 2011. 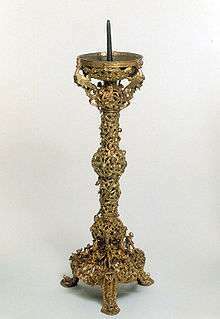 ↑ "The Reichenau Crozier – Victoria and Albert Museum". vam.ac.uk. 14 August 2011. Archived from the original on 28 November 2009. Retrieved 21 August 2011. 1 2 Brown, Ismene (8 February 2010). "The V&A is Wrong Far from closing, the musical gallery should be a palace of sensory pleasures". The Arts Desk.com. Retrieved 14 December 2012. 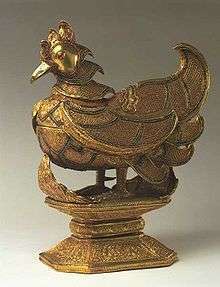 ↑ "Musical instruments in the South and South East Asian collection". V&A. Retrieved 14 December 2012. 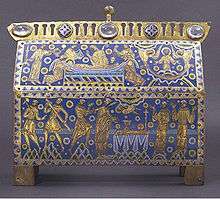 ↑ "Editorial: In praise of ... the V&A's instrument collection". The Guardian. 4 February 2010. Retrieved 14 December 2012. ↑ Kottick, Edward L. (2003). A history of the harpsichord. Bloomington, Ind. : Indiana Univ. Press. p. 94. ISBN 0-253-34166-3. ↑ "Grand piano designed by Edward Burne-Jones". V&A. Retrieved 14 December 2012. ↑ Kopf, Silas (2008). A marquetry odyssey : historical objects and personal work (1st ed.). Manchester, Vt.: Hudson Hills Press. p. 163. ISBN 1-55595-287-9. ↑ "Victoria and Albert Museum: House of Lords". Retrieved 14 December 2012. 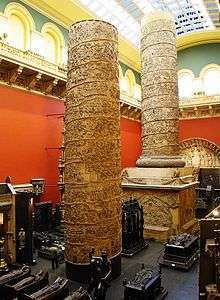 1 2 "To ask Her Majesty's Government what representations they have received or made in relation to the future of the musical instrument collection at the Victoria and Albert Museum. [HL2199]". www.parliament.uk. Retrieved 14 December 2012. ↑ Bradley Strauchen; Mimi Waitzman (18 March 2011). "The Art of Harmony: The V&A and Horniman Music Collections". Dulwich OnView. Retrieved 14 December 2012. ↑ Duchen, Jessica. "Should Strads be played?". Retrieved 14 December 2012. 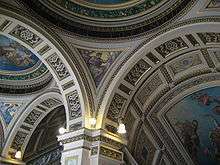 ↑ "Raphael Cartoons – Victoria and Albert Museum". vam.ac.uk. 21 October 2010. Retrieved 21 August 2011. ↑ "Constable – Victoria and Albert Museum". vam.ac.uk. 14 August 2011. Retrieved 21 August 2011. ↑ "Constable's Studies for the Hay-Wain – Victoria and Albert Museum". vam.ac.uk. 14 August 2011. Retrieved 21 August 2011. 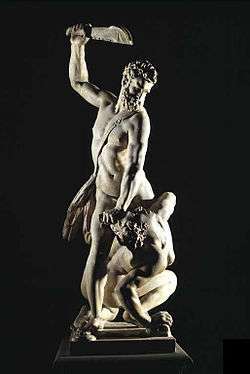 ↑ "Rodin at the V&A – Victoria and Albert Museum". vam.ac.uk. Retrieved 21 August 2011. 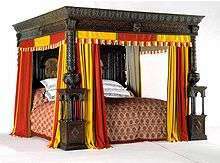 1 2 "The Oxburgh Hangings". ↑ Education Department — Victoria and Albert Museum Archived 2 July 2015 at the Wayback Machine. ↑ "Study Rooms – Victoria and Albert Museum". vam.ac.uk. Retrieved 12 May 2011. ↑ "Family activities in the Museum: Backpacks — Victoria and Albert Museum". vam.ac.uk. 6 May 2011. Retrieved 12 May 2011. ↑ "Research – Victoria and Albert Museum". vam.ac.uk. 5 May 2011. Retrieved 12 May 2011. 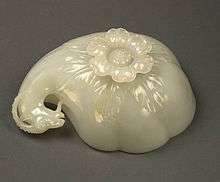 ↑ "Research Reports – Victoria and Albert Museum". vam.ac.uk. 6 May 2011. Retrieved 12 May 2011. 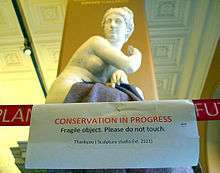 ↑ "Conservation – Victoria and Albert Museum". vam.ac.uk. 6 May 2011. Retrieved 12 May 2011.